a former British army base near the port city of Acre. I sat there truly frightened, in the back of an American-made halftrack climbing noisily through the hills of the southern Galilee on a pitch black night. Enemy bullets whirred overhead, and I imagined the next one speeding through the open top of the halftrack and plugging me between the eyes. 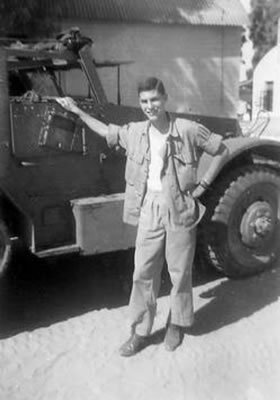 Occasionally, a racing bullet pinged against the steel sides of the halftrack, and I could hear and see tracer bullets responding from machine guns in armored cars leading our column of vehicles toward the unseen Arab soldiers. I can remember somewhat stupidly pinching myself to determine whether this was a dream or reality. Maybe the pain would wake me up and I would find myself in bed in my Columbia University dormitory. But the pinch did not have that magical effect. I was indeed in the back of a halftrack with nine other Israeli soldiers. It was August 1948. I was 18 years old. I had been in Israel only 10 days, five of them in an induction camp near Tel Aviv, and the last five in the 79th Armored Battalion, located in a small former British army base near the old walled city of Acre, the main Crusader port in Palestine a thousand years ago. Like thousands of young American Jews, I had wanted to join the fight to defend the newly born state of Israel against five invading Arab armies. However, I was among the few actually able to transform that desire into fact. And here I was. No basic training. Only pieces of a uniform. No prior military experience (I later served in the U.S Army during the Korean War). I had never fired the World War II German rifle that lay across my knees. I spoke Hebrew, the language of the country, in only rudimentary fashion - testimony to my lack of scholarship and interest during years of after-school Hebrew lessons. After 10 days in the country, I took most of my commands in a makeshift sign language. But I had the one skill that Israel badly needed: the ability to drive. In my native Virginia, I had a learner's permit at age 13, and my regular license at 14. Of course, I had never driven a ten-ton monster like this one, with wheels in front and rubber tracks in back. It had eight forward speeds, two reverse gears and no power brakes. My corporal, a Bulgarian Jew with a handlebar moustache, had spent the last five days teaching me how to tame this mechanical beast. Since I looked only 15 or 16 years old, he gave me a nickname that stuck - "Ha-yeled," Hebrew for "The Kid." As a freshman at Columbia University in New York City during fall 1947, I was close to the site of one of the most important events in Jewish history. The Partition Plan, dividing the British mandate of Palestine into two states, one Arab and one Jewish, was approved on November 29, 1947, by the United Nations General Assembly, then meeting at Flushing Meadows, only a few miles from my dormitory. Although the vote was 33 for and 13 against, with 10 abstentions, the Arab members of the UN vowed to make Resolution 181 null and void by force of arms when it became effective on the following May 15. I began laying plans to try to join the Jewish side. This was no easy task. The United States was not the friend of Israel that it is today. Although Harry Truman was the first world leader to recognize Israel, the U.S. followed the lead of other UN members in immediately embargoing sales of arms to Israel. The State Department stamped warnings in all passports making a passport invalid if used to serve in a foreign army, and warned that violators could lose their U.S. citizenship. United Nations observers were stationed at every Israeli port of entry to insure that only bona fide Displaced Persons could enter the country - this while well-equipped troops from Lebanon, Syria, Iraq, Trans-Jordan and Egypt were streaming across the frontiers with the intent of destroying the Jewish state. I enrolled in 1948 in a summer exchange program in England, then, as soon as possible, made my way to France. Neither my parents, two brothers nor anyone else had any idea that I was contemplating such a mission. The only French I knew was "Juif," the word for Jew. There were two listings in the phone book beginning with that word. The first was a kosher butcher shop. The butcher directed me to the newly-opened Israeli embassy. A secretary at the embassy wrote an address on a slip of paper and handed it to me silently. Two young Israelis in a bare room near the Arc de Triomphe questioned me, then sent me to three different Jewish physicians for a physical examination. A few days later I was on a train to Marseilles with two other American volunteers, Frank Perlman, 28, of Pittsburgh and Jack Shulman, 20, of the Bronx. Both Frank and Jack were veterans of World War II studying at the Sorbonne on G.I. Bill scholarships. All three of us now had fake Displaced Persons (DP) papers instead of our American passports. My new name was "Zeretch Itscovitch." In Marseilles, we lived in camps with survivors of the Nazi Holocaust. The Holocaust killed six million European Jews, including one million children - one-third of the Jewish population of the world. Virtually every country had closed its doors to Jews trying to escape the Nazi Holocaust. Millions would have been saved if just a few sets of gates had been open. I believed Israel, if it could survive, would always present those open doors. After two weeks in Marseilles, Frank, Jack and I began our final journey, a five-day trip across the Mediterranean on the Pan York, a rusting Panamanian ship with 2,800 Holocaust survivors now stuffed aboard. It was a very hot August. There was no fresh water aboard except for the daily ration of one cup a day. Our meals consisted of cheese and crackers for breakfast, broth and crackers for lunch, sardines and crackers for dinner. Every passenger was given a sleeping space on a shelf 20 inches wide and five and a half feet deep. No mattress. No pillow. There were no toilets with running water for the 2,800 passengers, just 10-hole outhouses. The five days on the Pan York were the most miserable of my entire life. Yet, for the Holocaust survivors, it was not that bad. They had seen the same and worse - for years, and often without food. Taking that first step onto the gangplank from the dock near Marseilles was the turning point of my life. I knew I would not turn back. I knew I would be causing my parents terrible pain and anxiety. I knew my friends and relatives in Virginia and my classmates at Columbia would think I had abandoned all reason. I knew that I was putting my life and citizenship in danger. But I also knew exactly what I was doing, and that what I was doing had to be my own decision. No one would have approved, especially my parents, so asking them was out of the question. Until the day of her death, my mother always believed I had been recruited by some fast-talking Zionist propagandist who was taking advantage of my naive nature. She could never understand that my act was simply a reflection of the example she and my father had always set to commitment to Jewish and community service. Forget the image of an Israeli soldier waking up in the morning and bravely setting out to battle the enemy. Like every army in the world, we spent most of every day wasting time. Armies are organized to fight, and most of the time there was no fight available. We were the only motorized unit in all of northern Israel, so whenever there was some fire fight anywhere along the Galilean truce lines, we were called upon to race to the support of hapless infantrymen who had been ambushed in some barren outpost. Such battles rarely lasted more than one night. The 79th spearheaded the major battle at the end of October 1948 that cleared the entire north central Galilee of Syrian, Lebanese and Iraqi troops. The religious boys would use white chalk to scroll slogans on the halftracks before battle, such as "If I forget thee, O Jerusalem, let my right hand lose its skill." I saw a soldier cry only once, and this because he was not allowed to go into battle as punishment for throwing a live hand grenade into an outdoor latrine. I was not sure whether the punishment was because of the mess or because he had wasted a valuable piece of ordinance. My mother came close to having a nervous breakdown. But all was forgiven when I returned to the U.S. and school in January 1949. The battles were over, and the army let me get back to the U.S. just in time for the spring semester. I call the Israel experience "my sophomore year abroad." I had arrived late for the war. The Israelis had suffered greatly before my arrival. The UN had given them legitimacy as a state, then let them swing in the wind before the Jews of the world could smuggle arms to them for use in defending their lives, homes and farms. Most of the Arab states invading Israel were members of the United Nations. Some 4,000 Israeli soldiers and 2,000 civilians were killed during the war that began unofficially on November 19, 1947, the date of the Partition Plan vote, and ended in March 1949. Considering population size, this was triple the number of casualties of the U.S. in World War II. No Israeli family went untouched. Frank Perlman and I came back to our homes. Jack Shulman was killed in the fight for Beersheba in December 1948 and is buried in Israel. Some 1,000 American and Canadian Jews volunteered for the Israeli armed forces in 1948. Forty were killed, including seven Christian volunteers. I have had a very lucky life, to say the least. At the age of 24, I was the holder of two university degrees, a veteran of two armies during two wars, married and working for a living as a newspaper reporter. I wrote a series of newspaper articles that won many awards and resulted in a major change in immigration law and the reuniting of hundreds of families separated to two sides of the U.S.-Mexican border. I've published a novel, served as media critic on the CBS Television Morning News and headed journalism departments at Tel Aviv University and the University of Missouri. I spent 18 happy years as dean of an excellent, supportive faculty at the University of Florida College of Journalism and Communications. But nothing that I have ever done in life could equal what I did as an 18-year-old boy in 1948. I am very proud of what Israel has accomplished over the years. Most important, its gates have always been open to Jews seeking refuge from oppression. In 1948, I cast my lot with 600,000 people with a will to survive. My wife and I just returned from Israel, now more than 7 million people strong and celebrating its 60th anniversary year. I still have to pinch myself to see if I actually managed to play some small role in that nation's birth and accomplishments. Author's note: The following first-person account is from the upcoming issue of Gainesville Magazine which will be available at the Gainesville Sun and select bookstores and Publix supermarkets in early July. The author is a Gainesville Magazine contributor and has given the Jewish Magazine permission to publish his article.